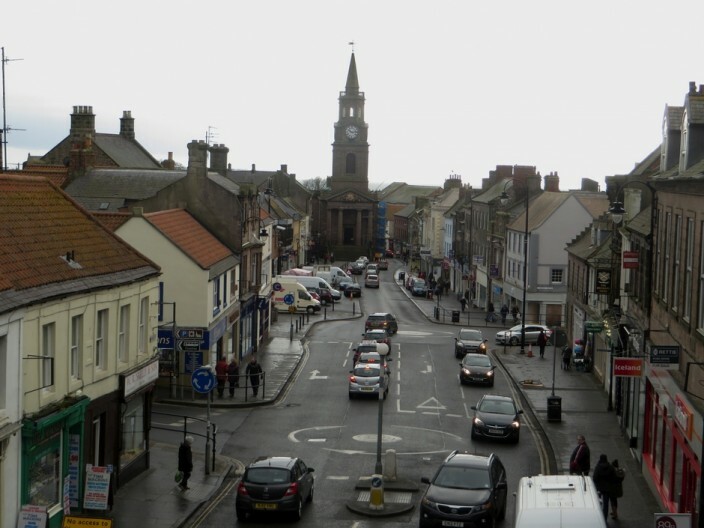 The walk starts in the centre of Berwick-upon-Tweed. In hindsight I perhaps should have started it at the end of the pier (which is really a breakwater), or over in Spittal, on the beach. 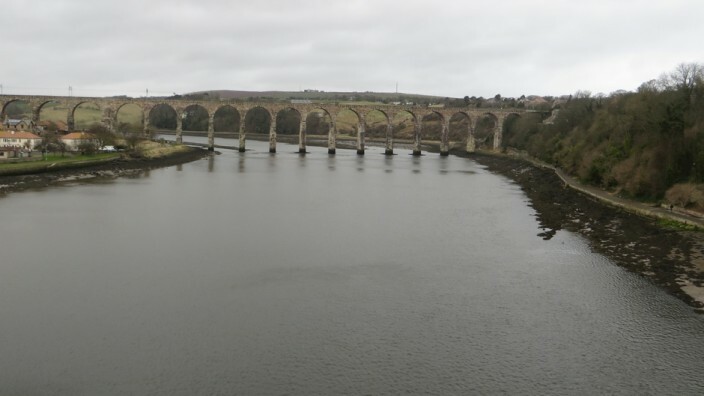 The first sight of the river is from the New Bridge as you walk across it, unless you’ve came from the south, in which case you crossed the river as you arrived in Berwick. After crossing the river, rather than dropping immediately down to riverside, I went via Tesco to pick up a sandwich for lunch. A little way further along the road past Tesco a path crosses the farmland towards the river. 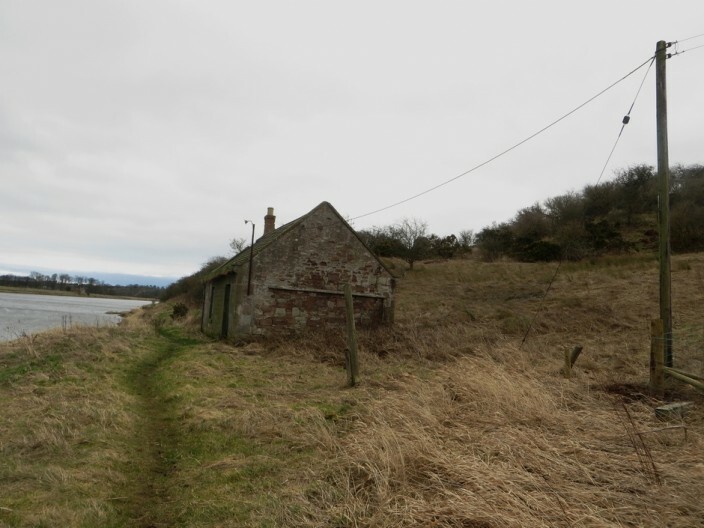 I took this path and after crossing a ploughed field I reached the top of the river bank. 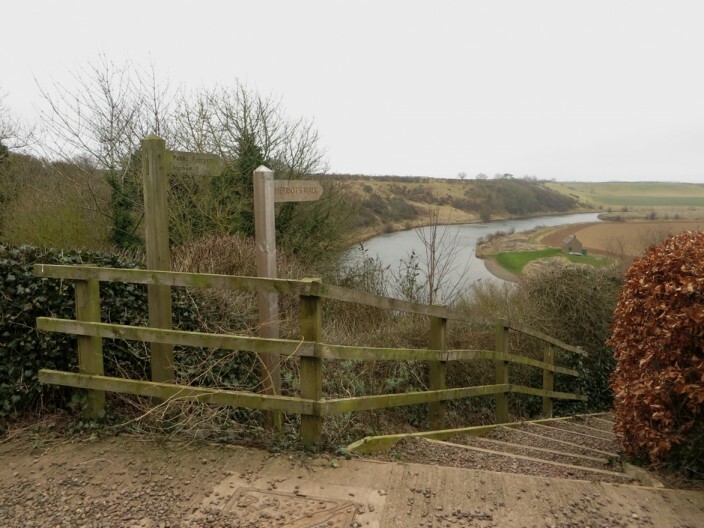 The path beside the river is well used by people from the town, and unfortunately suffers from plenty of detritus in the bushes. The path doesn’t pass under the bridge carrying the busy A1 over the river. 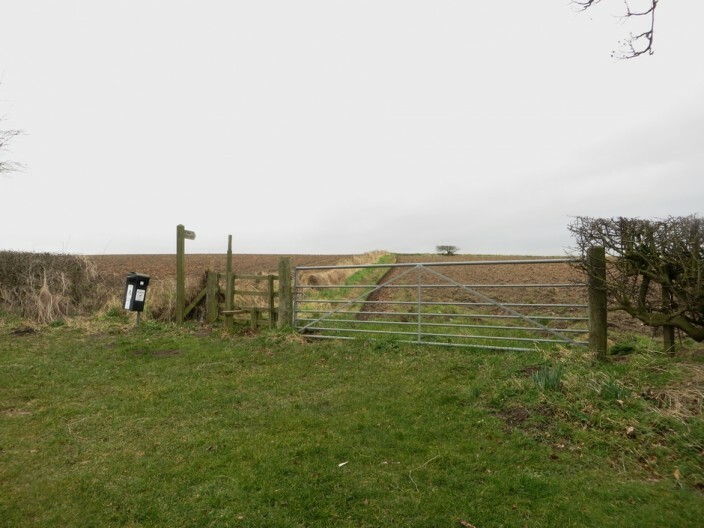 Instead the path crosses the A1 by the picnic area at East Ord which means waiting for a gap in the traffic. 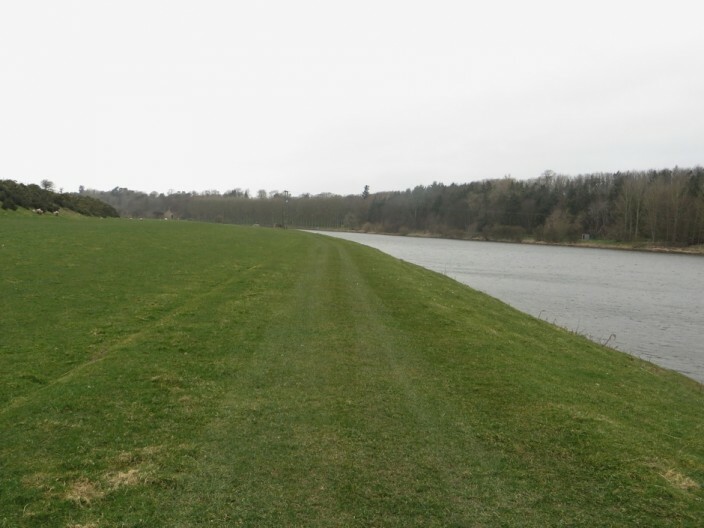 Then after crossing the river the path crosses a grass field at top of the steep bank. 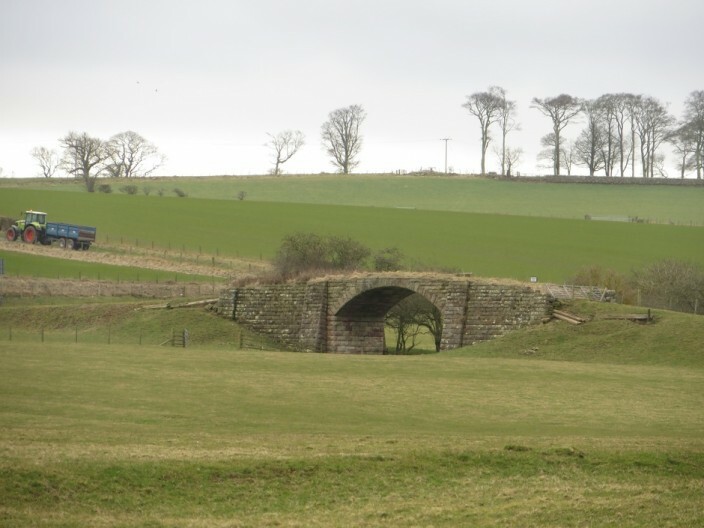 In the grass field beside the river is the unusual sight of an old stone bridge crossing seemingly nothing. 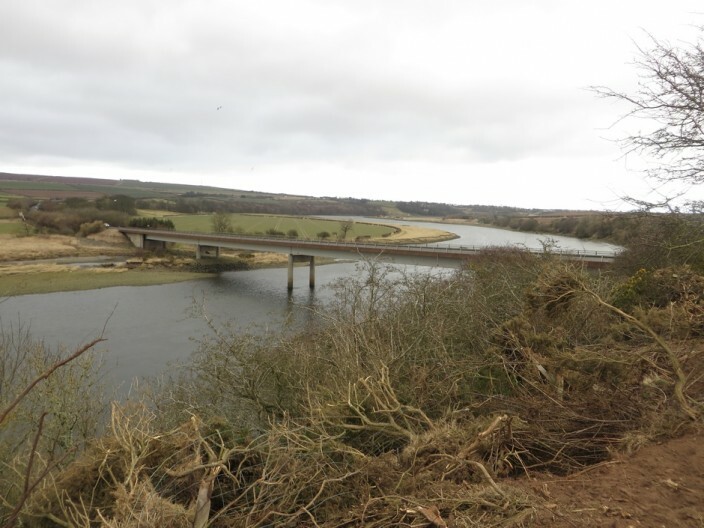 Once upon a time the branch railway line from Tweedmouth to Kelso passed under the bridge, but now only cuttings, embankments, and bridges remain to mark the route. 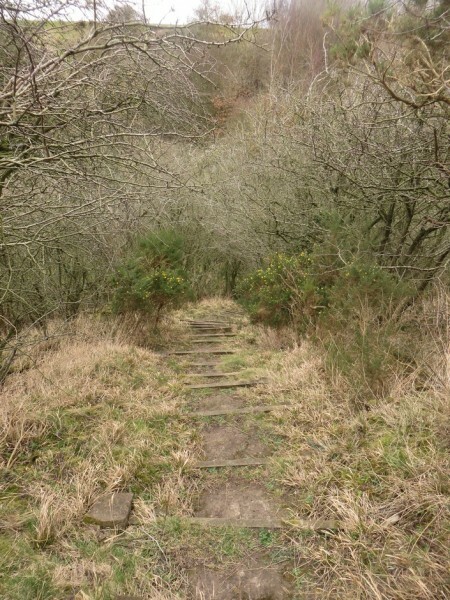 After crossing the grass field a set of steps descend down to the river side via the side of the ravine of Canny Burn, I’m not sure where the name comes from but its certainly canny steep! After the descent to the riverside the path doesn’t stray away from the bank until the other side of Horncliffe. 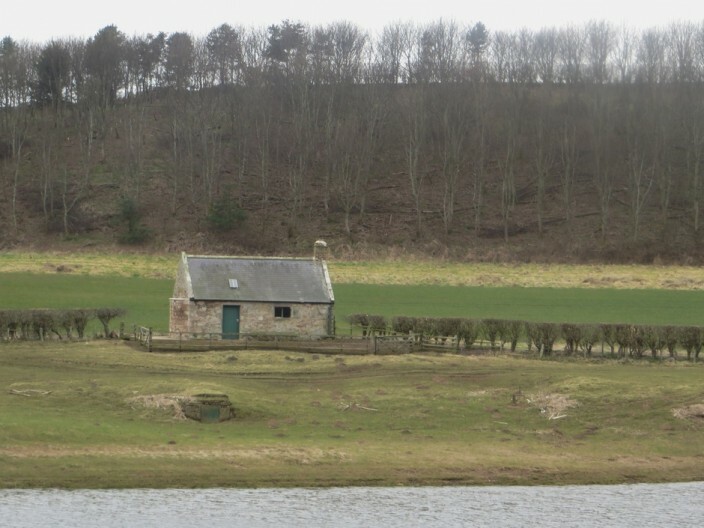 Several fishing shiels are passed in a short distance. 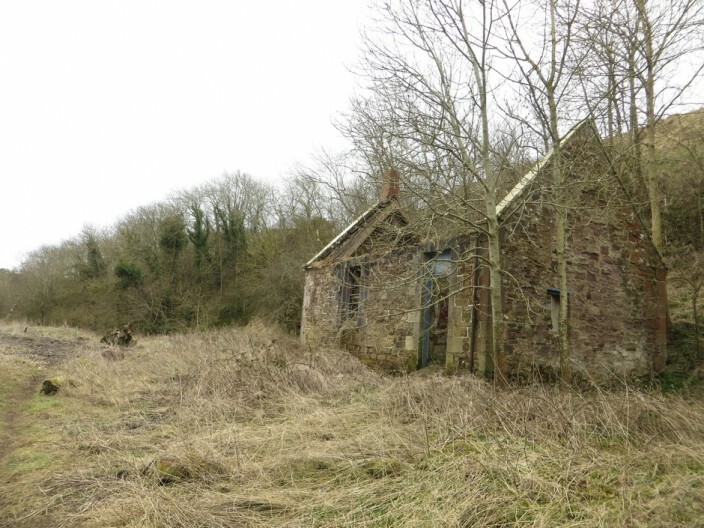 Most appear to be reasonably well maintained though a couple are derelict and lacking roofs. Their abundance perhaps hints at how active the salmon fishing industry on the lower stretch of the river once was. 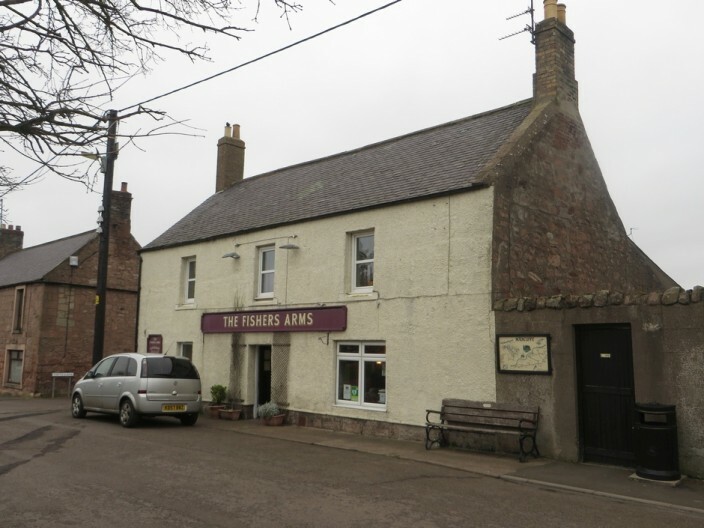 The shiels periodically appear on both sides of the river all the way from Berwick to Norham. 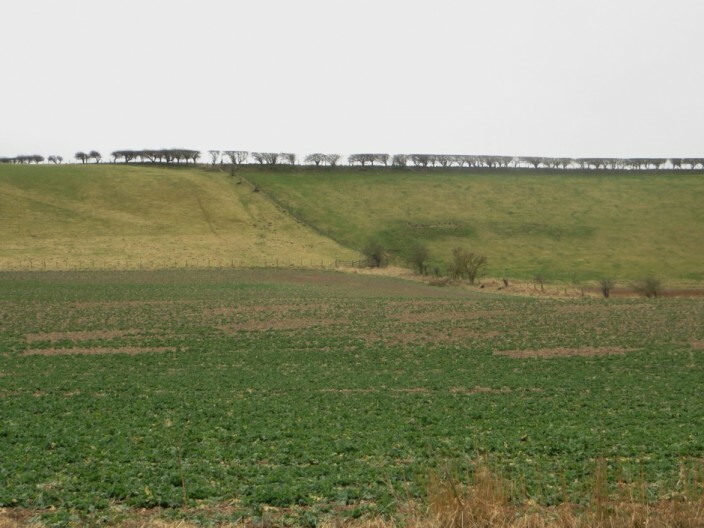 For a short distance rather than a steep bank on the riverside, a flat area of farmland lies beside the river. 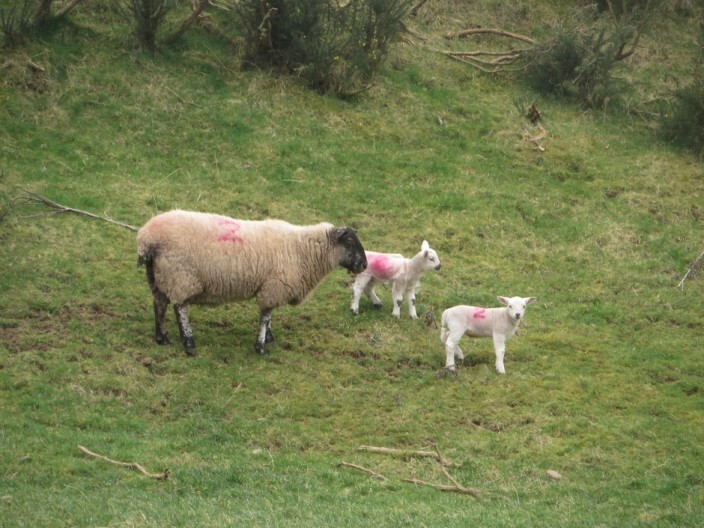 The grassland was occupied by a small number of ewes with new born spring lambs, no doubt numbers will expand as the season progresses. Now looking across to the north bank of the river means you are also looking into a different country. 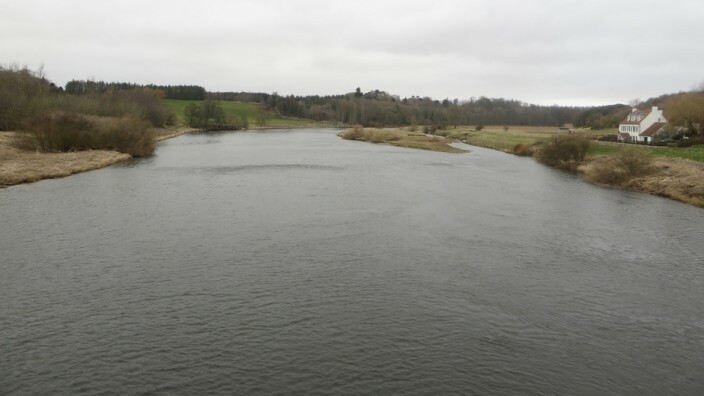 From here on in, in fact until after the river reaches Coldstream, the border between England and Scotland follows the centre of the river. At this point the walking is easy and on grass. 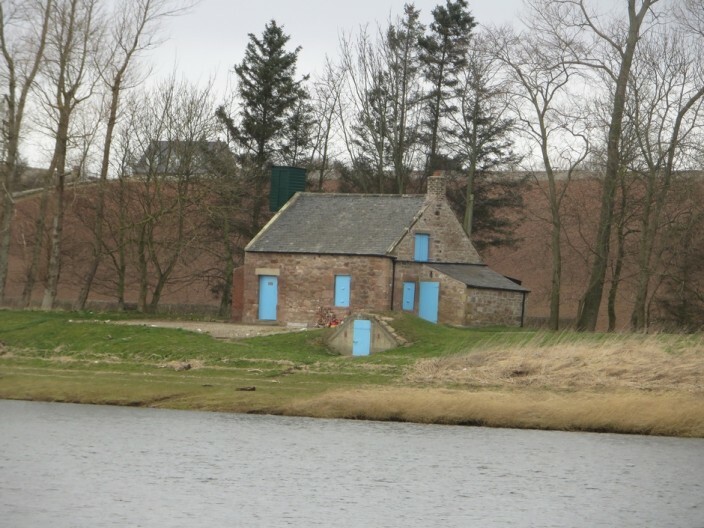 Unfortunately though there was a strong headwind to walk into, this was the most exposed section of the walk though, and the furthest away from the steep river banks that normally accompany the lower Tweed. Walking along the river there were sporadic sighting of birds floating on the water. 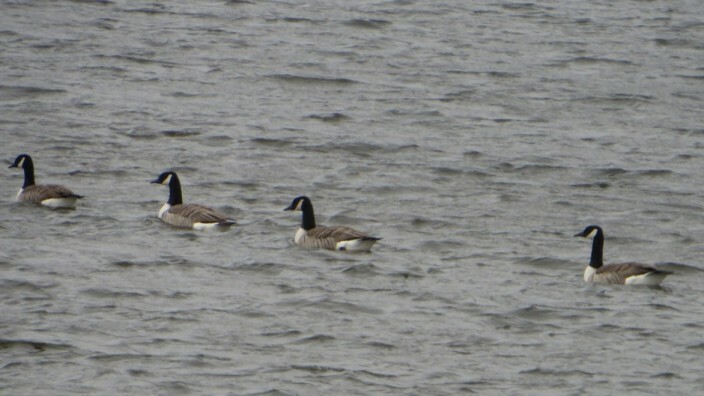 These included Canada Geese (pictured above), swans and oyster catchers. Doubtles there were others that a keener bird spotter than me would have seen. 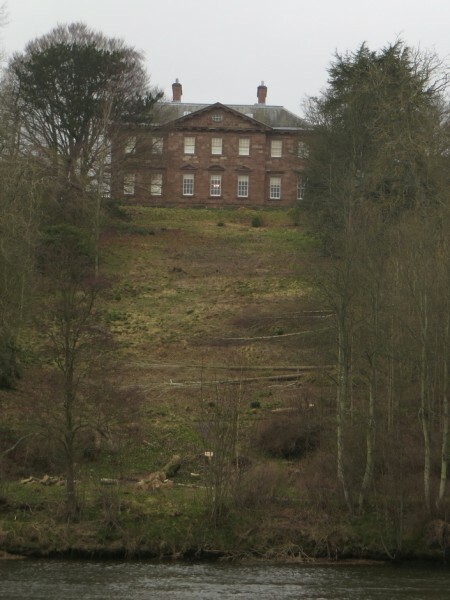 On the northern side of the river Paxton House can be seen through a cleared gap in the trees on the bank. 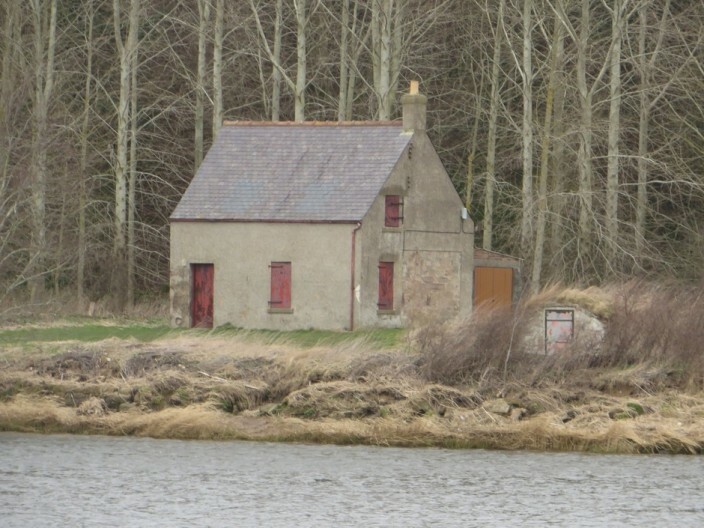 On the riverside itself is the boathouse which dates from the mid 19th Century. Rounding the bend in the river the Union Chain Bridge is revealed, majestically stretching across the river. 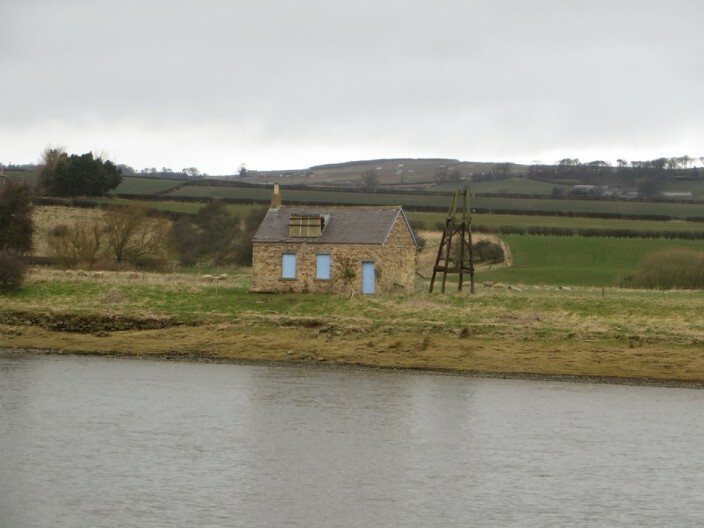 Looking across the Union Bridge from the Scottish side. 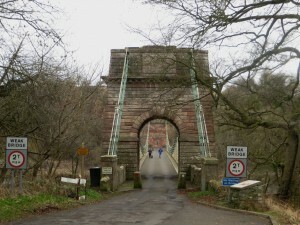 The Union Chain Bridge was built in 1820 to a design by Captain Samuel Brown. When it opened it was the longest wrought iron suspension bridge in the world (the bridge deck is 120 metres long) and is currently the oldest suspension bridge still carrying road traffic. 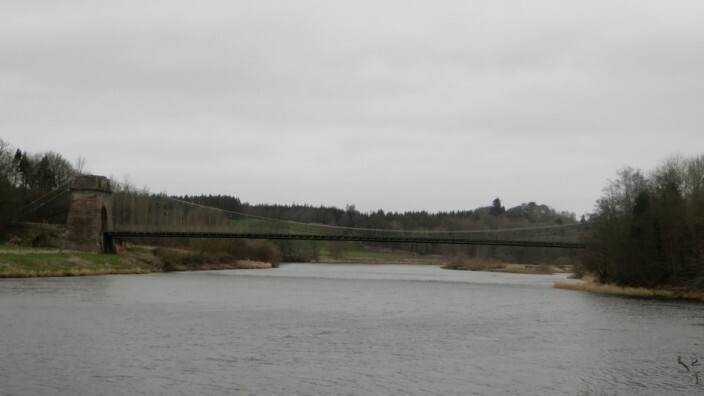 The bridge is a grade 1 listed structure (and category A in Scotland) and a scheduled monument. 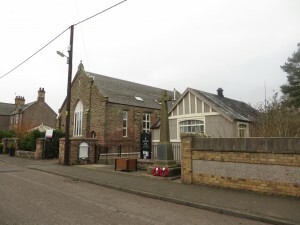 A local community group, the Friends of the Union Chain Bridge has been set up to support the preservation of the structure and to celebrate the bridge’s 200th birthday. Currently the bridge is in a poor state of repair having had little maintenance throughout its life and is in need of a new deck. 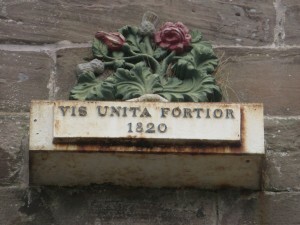 The hope is that this can be achieved in time for the bridge’s 200th birthday in 2020. Arriving at the bridge on my walk I decided I had to walk across the bridge to visit Scotland. Whilst in foreign lands I took a few photos and then returned to England. 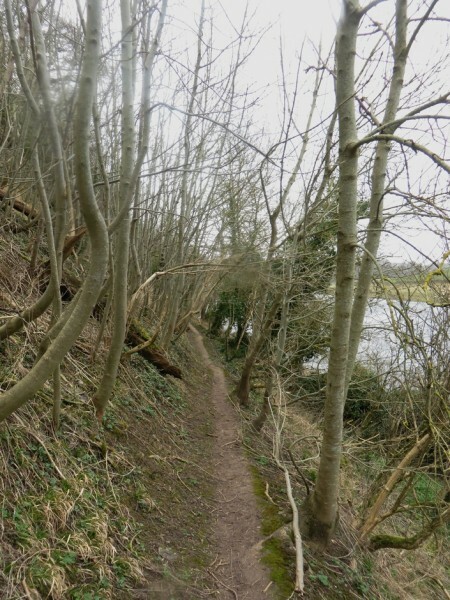 The path continues alongside the bank for the short distance to Horncliffe. 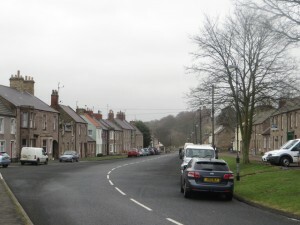 At Horncliffe I climbed the steep bank and had a walk around the little and quiet village. 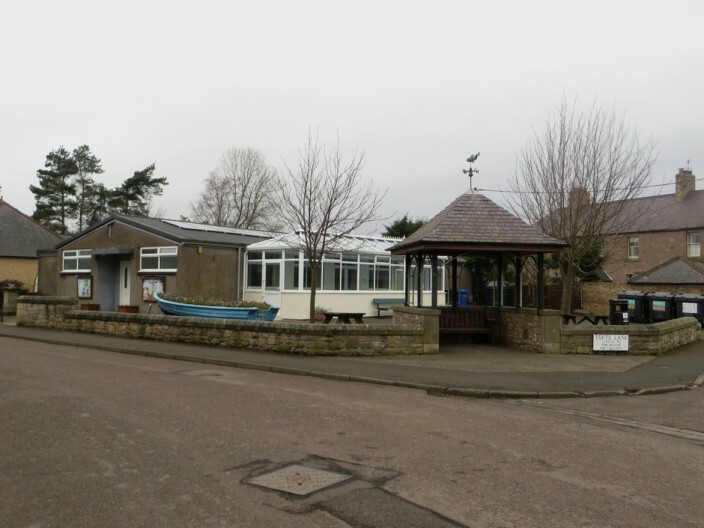 There’s not a lot to mention about Horncliffe save that it has the normal village assets of a church, pub, village hall, war memorial and houses. Finding the steps down to the river wasn’t easy but I found them along a back lane. I have no idea what Herriot’s Walk is, but a sign also pointed people looking for it in the direction of the river. 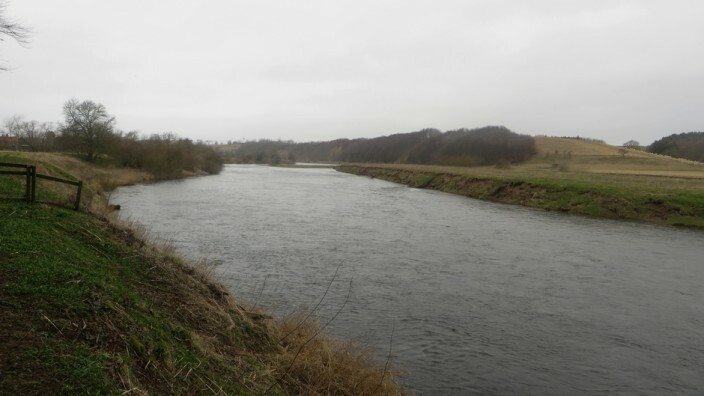 Back on the river bank the the path soon narrows and climbs a bit away from the river and begins to weave its way through a rough collection of trees which line the bank the rest of the way to Norham. Because the trees cover isn’t dense views can still be had between the branches across the river, but because the path is narrow and the bank steep a little care needs to be taken to not fall into the water. 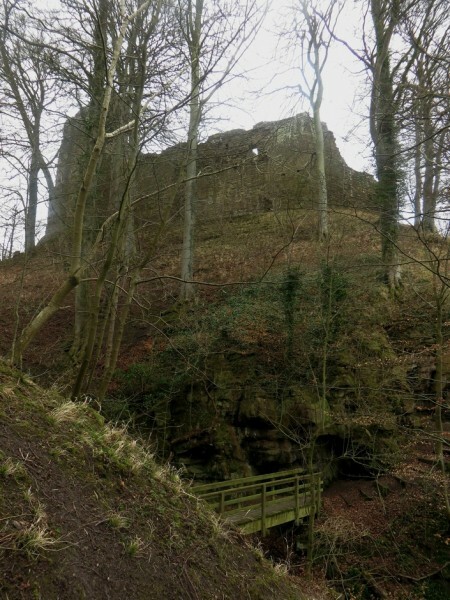 Eventually, rounding a corner to cross an unnamed burn, the first close up sight of Norham Castle is had, the walls of castle towering over the steep sided ravine of the stream. The imposing sight means the walk is nearly at its end, but not yet as there’s no easy up the steep ravine, you have to walk around to the other side. 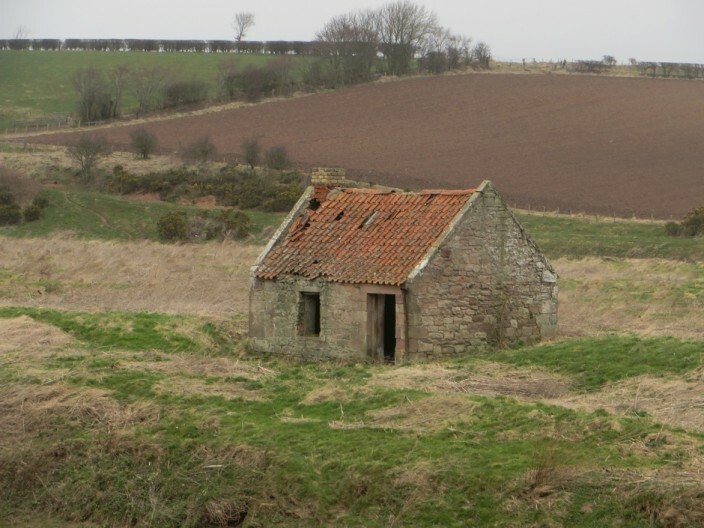 As I wanted to have a close look at the Castle I left the River Tweed for the final time and crossed a grass field towards the road. Norham Castle proves an imposing sight from the main street of Norham. 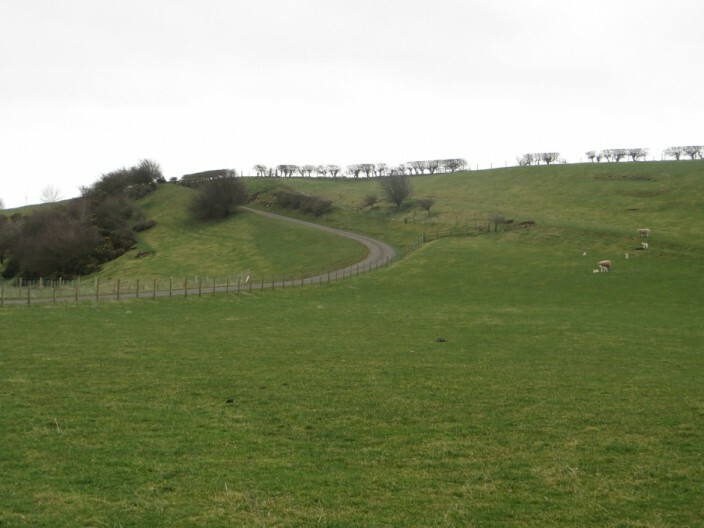 The ruins stand on a hill in front of which the main road curves around and inland in similar fashion to Bamburgh. 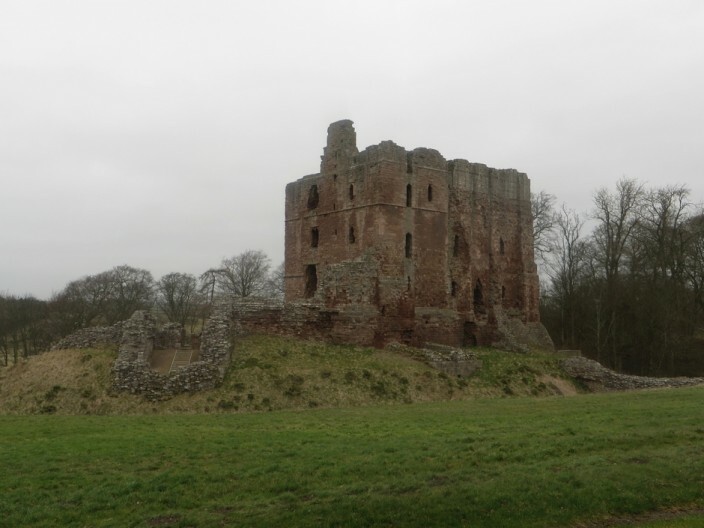 Norham Castle is owned by English Heritage, and unfortunately is only open during the summer months. The ruined site is poorly defended though, in places the low walls of the original ruins are the only thing attempting to prevent entry into the site. Leaving the castle I headed into Norham to have a look around. The village is larger than I expected it to be and pleasantly still retains a lot of character. It still maintains an independent bakers and butchers (where I bought some gorgeous sausages to take home for tea). 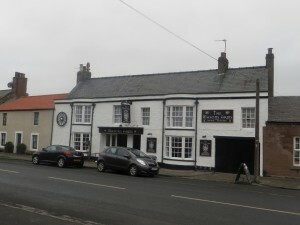 A large village green complete with swings and other play equipment is right in the centre of the village and there are 2 pubs in which to rehydrate should your walk be a warm one. 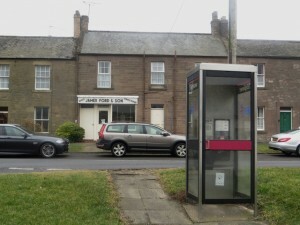 Eventually after pottering around I settled at the bus stop to wait for my carriage back to Berwick. 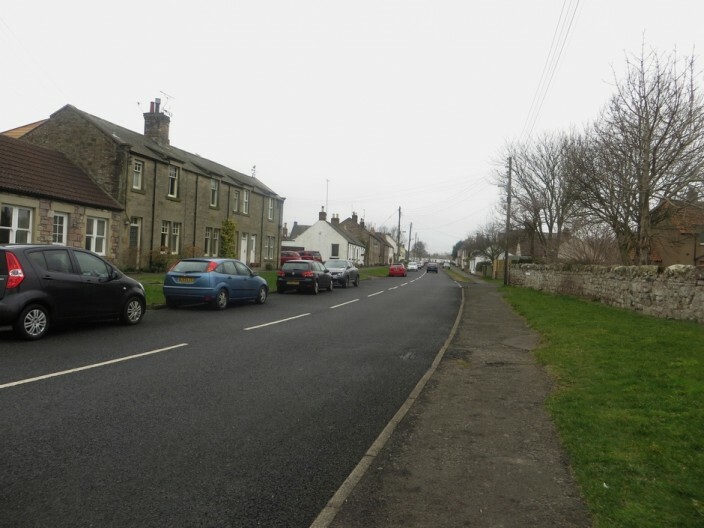 The village is served by Perrymans route 67, which links Berwick to Norham before going onto Coldstream, Kelso and Galashiels. There’s a bus every 2 hours throughout the day. 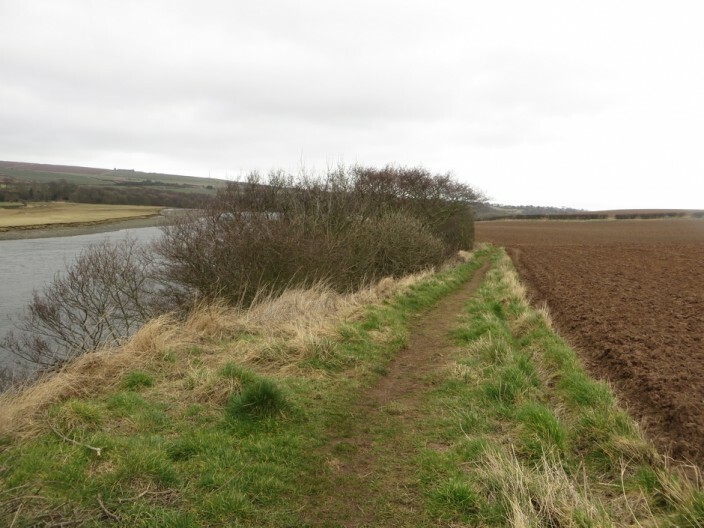 Before hopping on board for the 20 minute journey to Berwick I reflected on an enjoyable walk along the secluded riverside and made a mental note to return in the future to explore the ruined castle in greater detail. Moving up to the area and love walking. I enjoyed your photos. My wife and I visited Norham this August (2017) and there were strong-smelling purple flowers growing in profusion by the river on the walk behind St. Cuthbert’s. Would you happen to know what kind of flower they were? Many thanks for your comment. Unfortunately I don’t have any idea about the flowers on the river bank. 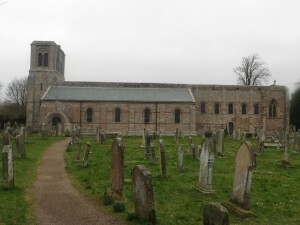 I did this walk in spring and I don’t think I’ve been around Norham during the summer months. Probably Himalayan Orchid – not native to Scotland but brought here on the wools that were imported from Asia to the woollen mills upriver. When the fleeces were washed, the seeds of these pretty flowers ended up in the water and hence the river.